Inner Mongolia (Mongolian: , Öbür mongɣul; Chinese: 内蒙古; pinyin: Nèi Měnggǔ; occasionally romanized to Nei Mongol) is the Mongol autonomous region of the People's Republic of China and lies in the north of the country. Inner Mongolia borders, from east to west, the provinces of Heilongjiang, Jilin, Liaoning, Hebei, Shanxi, Shaanxi, Ningxia Hui Autonomous Region, and Gansu, while to the north it borders Mongolia and Russia. It is the third-largest subdivision of China spanning almost 300 million acres or 12% of China's land area. It has a population of about 24 million. The capital is Hohhot. The majority of the population in the region are Han Chinese, with a large Mongol minority. The official languages are Standard Mandarin and Mongolian, the latter written in the classical alphabet. 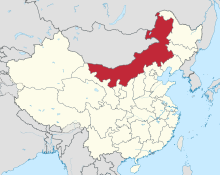 In Chinese, the region is known as "Inner Mongolia", where the terms of "Inner/Outer" come from Manchu dorgi/tulergi. Inner Mongolia is distinct from Outer Mongolia, which was a term used by the Republic of China and previous governments to refer to what is now the independent state of Mongolia plus the Republic of Tuva in Russia. In Mongolian, the region is known as öbör mongγol where öbör can mean south, inner, front, bosom, breast. Han Chinese are the largest ethnic group, about 80% of the population. Mongols are the second largest ethnic group, about 17% of the population. There are more Mongols living in Inner Mongolia than in the independent nation of Outer Mongolia. The Five Pagoda Temple in Höhhot, a Buddhist temple. Xiaozhao Temple, also known as Chongfu temple, is a Lamaist temple built in 1697 and favoured by the Qing Dynasty emperor Kangxi. Zhaojun Tomb is the tomb of Wang Zhaojun, a Han Dynasty palace lady-in-waiting who became the consort of a Xiongnu ruler. The Arshihaty Stone Forest/Hexigten UNESCO Geo Park, has magnificent granite rock formations formed from natural erosion. Five-pagoda Temple in the capital of Inner Mongolia Hohhot. It is also called Jingangzuo Dagoba, used to be one building of the Cideng Temple.